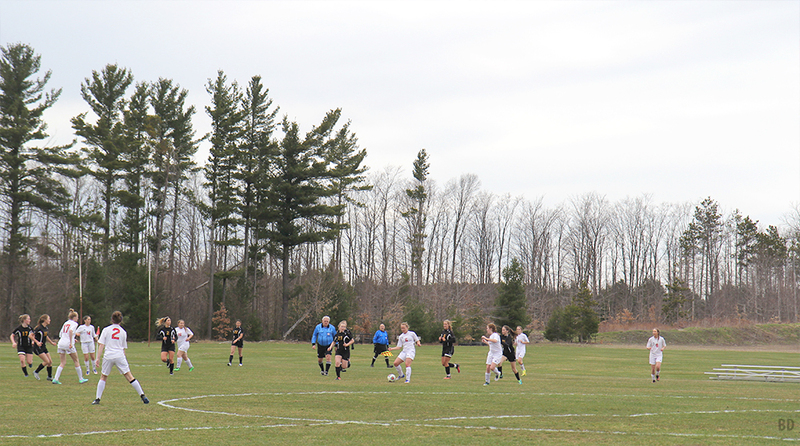 This was the third game of the 2017 season and the first home game for the Benzie Central Girls Varsity Soccer team. It was overcast and 50-ish, so a bit chilly but not freezing. 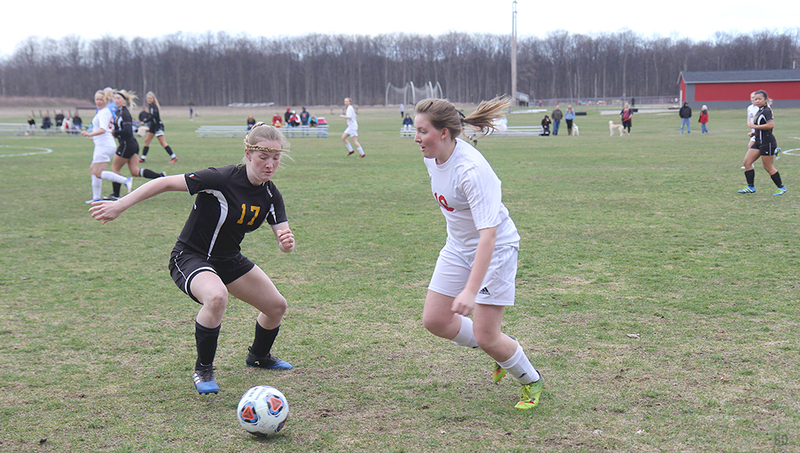 During the first half, Leland took 13 shots on Benzie goalkeeper Maile Church, and they were able to score on three of those opportunities. At 13 minutes into the first half, #11 freshman Mollie Grishaw scored because three of our defenders stabbed in and she got past each and every one of them. Two minutes later, she scored again, this time on a cross from #20 freshman Gigi Anhut — Grishaw was unmarked in the box when she received the cross. Grishaw’s third goal of the game (called a “hat trick”) came three minutes later, again because our defense were stabbing in. The last goal came with just 1:30 left on the clock in the first half, when #17 senior Delaney Drake scored on a free kick deflection on the goal line. Meanwhile, our Benzie girls only had two shots during the first half (one from Hanna Burch and one from Mimmi Peuhkurinen). The coaches switched around a lot of positions in the second half, taking some hits on defense to try to create some offense. During the second half, Leland had nine shots, compared with three for Benzie (one from Mimmi, one from Allana, and one from Brook Lautner). Leland scored on two of these shots: the first was five minutes into the second half, when #6 junior Rowan Wilson was unmarked at the 18-yard line. 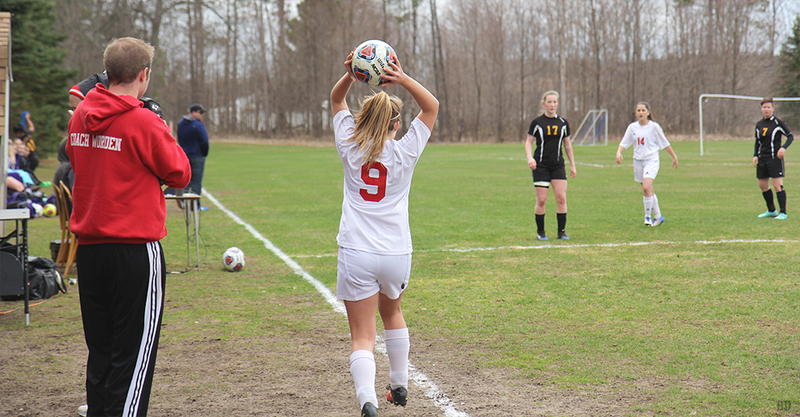 The second goal came six minutes later, when Grishaw scored her fourth goal of the night from the 10-yard line in the center of the field, again she was unmarked. 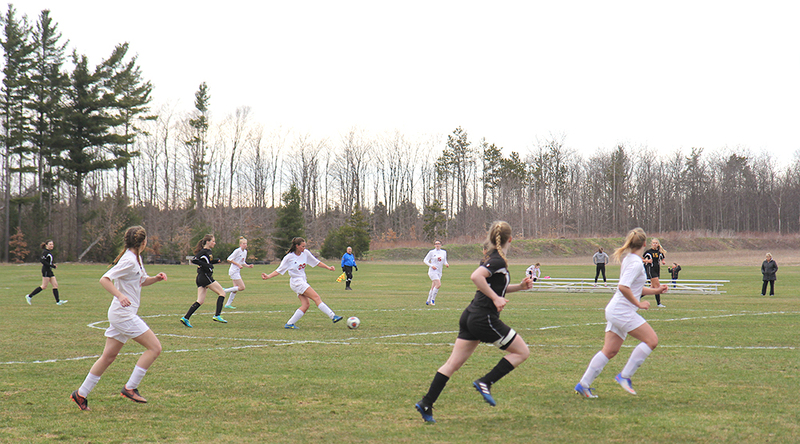 Our Benzie girls seemed to play somewhat better in the second half, but it also helped that Leland’s coach was putting in his second-string players. We were missing: Kaitlynn Patacky (concussion), Promise Thomason (family), and Emily Johnson (health). 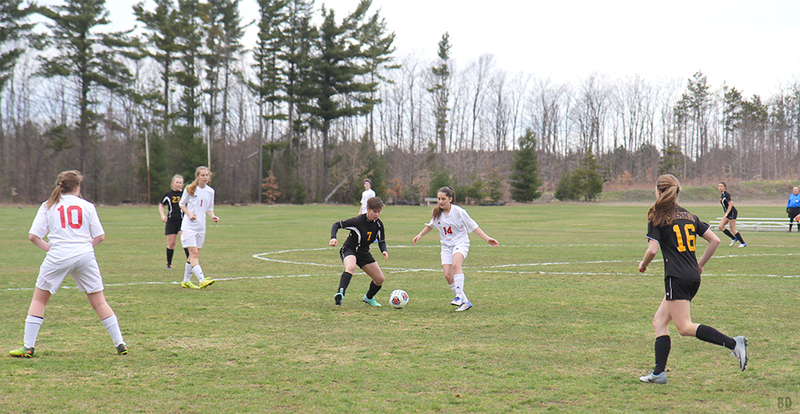 Again, we had six who were not able to dress out, because our extra jerseys have not arrived (Lucy Straubel, Clara Reed, Brianna Dufrane, AuSable Kreiner, Ashley Winfrey, and Emma Quick). Lisa Teichman (Jenna Saier’s mom) brought bananas and Shannon Burch (Hanna’s mom) brought granola bars and oranges for halftime snack. Referees were Bilc Anderson, Roger Fauble, and Warren Wahl. 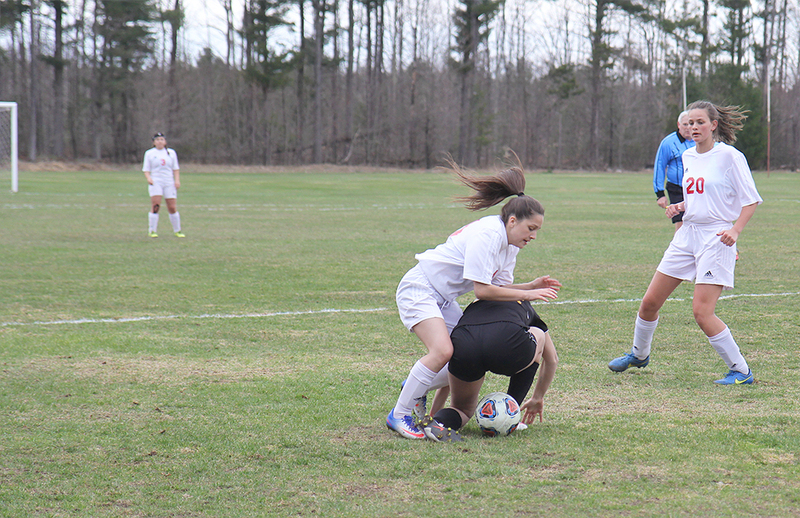 Below you’ll find photos that I took, as well as photos by our freshman soccer player Brianna Dufrane, which are marked with a BD watermark in the bottom right corner. Also, here is a link to stats coverage from the game on the Traverse City Record Eagle‘s website.